If militaristic empires and the race to evade dark ages weren’t difficult enough, Civilization VI adds a challenging new system in its upcoming Gathering Storm expansion: weather. We got to play a preview build of the game and see firsthand just how ravaging the new climate system can be. I start a new campaign as Russia, promising myself that I’ll be a generous and science-driven ruler. China is the first civilization to find me, so after introducing myself to Emperor Qin Shi Huang, trade begins between our two budding nations. They even get my only Great Work, as a show of goodwill. What starts as a prosperous alliance quickly devolves into a revenge campaign after China launches a surprise war, wresting my capital city, St. Petersburg, away from me. Thankfully, I’d invested in a settler who founds my new capital Yaroslavl in a nearby floodplain just one turn before St. Petersburg’s occupation. Prior to the expansion, floodplains were restricted to desert tiles, but in Gathering Storm, floodplains can exist anywhere there is a river. There’s a degree of risk to establishing Yarolsavl so close to the water – natural disasters like floods, hurricanes, and volcanic eruptions are common in the expansion – but smart players will learn how to take advantage of this new geography. Players can build new dam districts to mitigate flood damage and add more housing to their cities. Building a city near a volcano nets you a point of Era Score, which will help keep you out of a dark age. And if the volcano erupts, it might destroy your tiles, but like flooding, the volcanic soil left behind increases your crops’ yields. Looking at the desolation around Yaroslavl, I realize the consequences of my gamble to construct in a floodplain, but I know this enables me to later build dams that can create energy for my city. Dams are one of the new engineering projects you’ll get to complete in Gathering Storm, alongside railroads, tunnels, and canals. 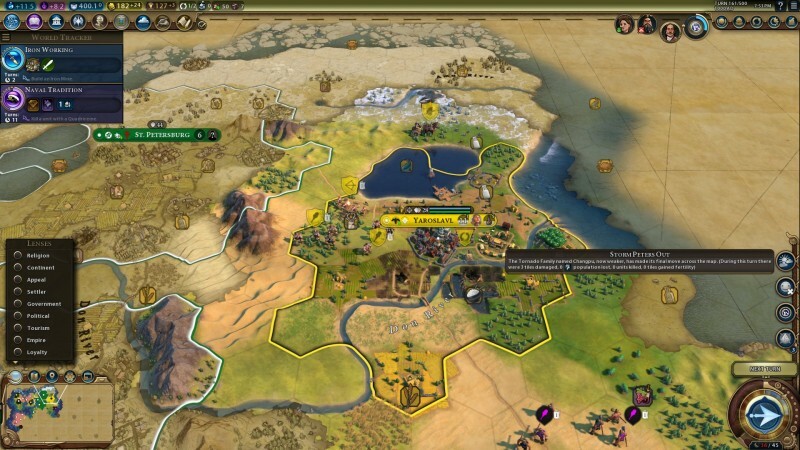 Firaxis says canals were a highly requested inclusion, as they allow players to connect two bodies of water, or one body of water to a city center. This means your naval armada can navigate the world faster. Yaroslavl doesn’t have the kind of capital to invest in an armada, though. Not yet. There are five different difficulty settings in Gathering Storm, including a Hyperreal setting that causes floods and eruptions to occur more frequently than they did historically. Shortly after founding Yaroslavl, I meet Jadwiga, the King of Poland, who sails overseas to tell me that she wants to team up against China. I don’t hesitate for a moment. St. Petersburg was my economic hub, and I’m short on gold, so I test our new alliance with a trade: Poland will send me a hefty sum of gold each turn in exchange for Gathering Storm’s new currency: Diplomatic Favor. Players earn Diplomatic Favor by participating in trades and establishing government systems. 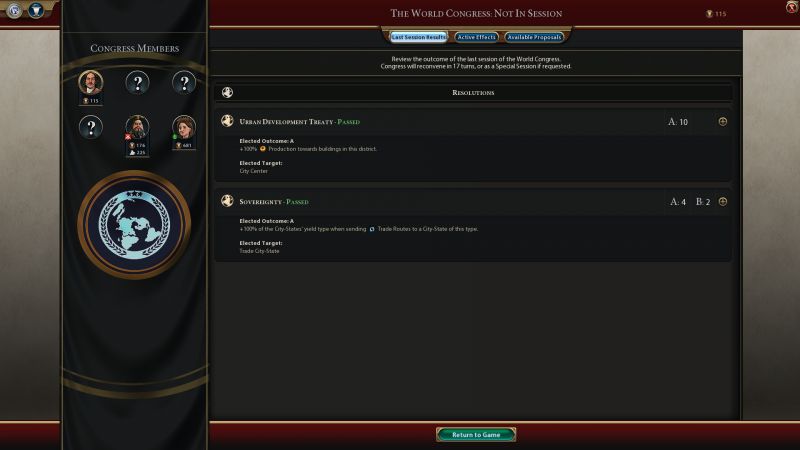 Once you’ve accrued some favor, you can spend it at the World Congress, a returning feature from Civilization V, where each world player votes on resolutions that impact the gameplay until the next session of Congress. “We didn’t feel [World Congress] had a really big impact on the game previously,” said lead producer Dennis Shirk. In Civilization V, you vote on resolutions, but Gathering Storm expands the mechanic, allowing you to tailor resolutions to your private interests and leverage Diplomatic Favor to increase the likelihood that a resolution passes. It will take an army to reclaim St. Petersburg from the Chinese, so I tailor one resolution to decrease production costs by 50 percent until the next Congress. I want to hurt China’s trade, so it costs me a hefty sum of Diplomatic Favor to end the trade of luxury teas, which China specializes in. The resolution for decreased production passes, and my cities begin producing military units at incredible speed. Speaking of climate systems, the dominoes fall on China when I see tornadoes, a hurricane, and a drought ravage the tiles around St. Petersburg (and making me wonder if St. Petersburg is even worth saving. But of course it is, it was mine first!) I have nearly a dozen military units thanks to the World Congress resolution, so my siege begins. The war drags on into a new era, and I lose most of my units in the fight, but eventually, I kick the Chinese out of the city. St. Petersburg belongs to the Russians once more. Natural disasters and the World Congress were game-changers in my Civilization VI experience, resulting in some of my campaign’s greatest highs, but Gathering Storm comes packed with numerous other features that fill out the expansion. I didn’t get to interact with the late-game climate change systems, but, eventually, deforestation and reliance on fossil fuels increase CO2 emissions, global temperatures, and sea levels. According to Firaxis, however, you don’t need to protect the environment in order to win the game. “We’re not trying to prescribe that players have to be tree huggers in our game,” Beach said. “You can cause sea levels to rise and still win the game.” Although Beach did suggest that protecting the environment will aid in your achievement of the game’s new Diplomatic Victory scenario. 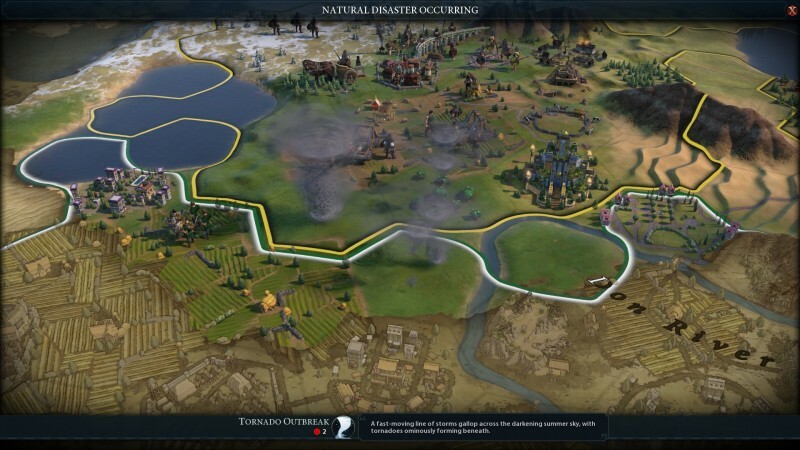 In addition to the new climate change, natural disasters, and World Congress systems, you can expect a lot more of the Civilization VI content you’d expect from expansions, including nine new civilizations to command, such as the Maori and Canada, more than a dozen new Wonders, two new Scenarios, new Civics, and new Engineering Projects (like canals). I’m excited to explore more of this content and watch the game’s many systems interact when Gathering Storm launches for PC on February 14. The expansion costs $39.99 and requires the base game to access it. While you wait, check out our review of Civilization VI’s last expansion, Rise and Fall.